Thunderstorms that have battered parts of France over the weekend are set to continue for at least a week, forecasters have warned. In its early Monday update, Météo France placed seven deparments in the northwest of the country - Côtes-d'Armor, Ille-et-Vilaine, Mayenne, Morbihan, Orne and Sarthe on orange alert for violent thunderstorms from 10am. The current storm alert lasts until 12midnight, and more departments could be added throughout the day. Forecasters warned that heavy rain could lead to localised flooding, with up to 60mm of rain - equivalent to a month's rainfall at this time of year - in a matter of hours. Hail and winds gusting up to 80kph are also forecast. Finistère, meanwhile, is on orange alert for flooding. 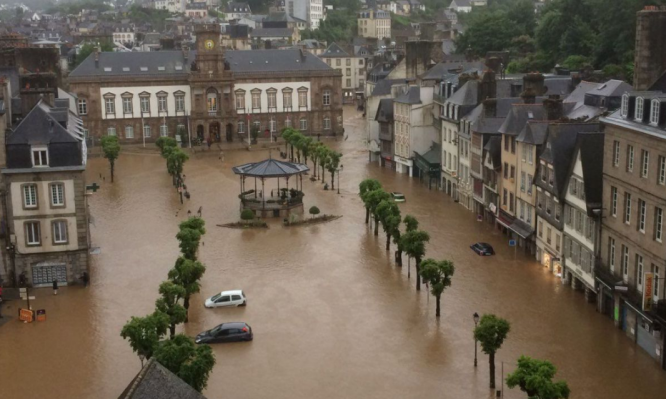 The town of Morlaix has already suffered in the weekend's storms. The latest alert came as residents across a large swathe of the country were clearing up following weekend storms. For several hours on Sunday, 48 departments were on Météo France's second highest weather warning. As the clean-up begins, so do questions over what storm damage is covered by home insurance policies. Not all home insurance policies include storm and flood damage insurance. Check if damaged goods covered by your insurer. For example, items stored in cellars or garden equipment may not necessarily be covered as standard. But special provisions exist in case of water or lightning damage … so it is advisable to be precise in any claims over the cause of any damage. Before arranging for any work to be done, contact your insurer to report any damage. Under normal circumstances, you should get in touch with your insurer within five days. This guards against delays having your bills reimbursed. If you were away at the time of the storm, then any claims should be made within five days of the date of your return, though in the case of damage caused by highly-publicised storms it may be argued you should have known. Take photographs and video of any storm damage - and, if possible, hailstones - to give an indication of the scale of damage to help with estimates. If your home is damaged by freak weather ask whether it was due to tempête (storm) or catastrophe naturelle (natural disaster), as insurance claims are different for the two. #Météo #Bretagne #Morlaix #Orage Crue importante en cours du Morlaix et de ses affluents comme ici à Ste-Sève (29). Il est tombé l'équivalant de trois semaines à un mois de pluie en seulement 30 minutes. A natural disaster covers naturally-occurring floods, landslides and earthquakes and must be declared as such by ministerial decree, determining the time and area concerned and the kind of damage. All typical home insurance policies (assurance multirisques habitation) include a garantie catastrophe naturelle. Insurance for storms, on the other hand, would include tiles blown off, trees falling on your property etc. In a very violent storm both might come into play - damage from flooding could be a natural disaster, while wind damage would come under storm cover.